The Urban Politico: Is President Wyclef A Good Thing Or Bad Thing For Haiti? Is President Wyclef A Good Thing Or Bad Thing For Haiti? Okay so since I reject the impulse to be cynical whenever possible, when I heard that Wyclef wanted to run for President of Haiti I thought, "why not!" I mean I'll be the first to acknowledge that Wyclef might not have all of the professional qualifications to be the President of a country, but I mean what are those anyway? (See: Ronald Reagan). So at the very least the transition from entertainer to politician is not unprecedented. Also, it's positive news for Haiti because it puts Haiti back in the news! This is never a bad thing in my opinion. As long as there is a close eye on the conditions there I think the people will only benefit. How much they benefit still remains to be seen, but I have hope and I believe that Wyclef's intentions are genuinely because he wants to improve the quality of life of the Haitian people. But as with most things these days, not everyone agrees with me. "More conscious of the way we raise our daughters"
2. There is something extremely romantic, biblical and karmic about "the lowest of these" and the first becoming last and the last becoming first. Having a Haitian boy come to America, become a super celebrity rapper, musician and producer extraordinaire and then return to the country of his origin to elevate the quality of life of the people is amazingly wonderful to me. Eighty percent of Haiti lives in poverty and it's one of the poorest countries in the Western Hemisphere. This is totally unacceptable. Hip Hop, at its core structure, is democratic, innovative and technological. 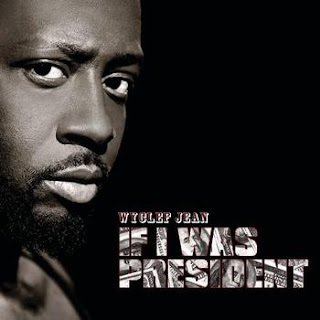 In a song similar to that of Nas' tome, Wyclef made a song entitled, "If I Was the President" in 2004 (thank you @redbully04 & @jazzzyone), which was serious, contemplative and offered great socio-political commentary. Wyclef is not dumb, by any stretch of the imagination and, thankfully, he comes from Old School Hip Hop, not the kind of clap-trap the mainstream is used to these days. 3. Like you, I sat in horror watching so many people die in Haiti as a seemingly cruel Mother Nature pelted people with falling rocks and crushed their bones between rubble. It's in these times that I wonder where is God in the presence of human suffering? I don't know the answer but I believe that Wycelf's run for President will maintain attention upon a country that still requires great assistance. Haiti is already "old news" in the U.S. media and I am so excited to see the country infused with even more reasons to stay at the forefront of our consciousness. Sadly, we live in a celebrity-obsessed culture that will keep their eyes on Wyclef, if for no other reason than to catch him if he messes up. But either way, if they follow Wyclef, they will follow Haiti and that's all that matters. Americans tend to have short memories. 4. I have read and heard the criticism about Wyclef running and, while some of it is most certainly valid, like @FreedomTweet's insistence that Haiti needs experienced leadership and can't afford a gaffe at the Presidency, I am not sure that experience, alone, is necessary and it seems as though something more along the lines of a miracle is needed for Haiti. Divine intervention. I believe that, having seen these dead bodies and the extent of the destruction in Haiti up close and personal, Wycelf's spirit was shaken to its core, his humanity was touched in a manner unparalleled and he feels "called" to do something much bigger than bringing in $10 million into Haiti via his foundation, Yele Haiti. I have no proof. It's simply what I believe. There's a reason why Wyclef was crying on television and that level of shamelessness in a hypermasculine culture is only brought about through divine intervention. 6. I believe Wyclef can do a good job. I know it seems outrageous that someone with little official, political experience would be able to govern; but we must accept that Haiti is still in a state of emergency and remains a disaster area. What is needed in this particular day and time is for someone to keep the attention on Haiti, collect the projected $105 million dollars pledged to the country, BE VISIBLE and PRESENT and put together an excellent cabinet that can meet the needs of the people. Wyclef must surround himself with excellent cabinet members. But as the President, it seems as though the greatest qualification is to care enough to seek new opportunities and bring about the impossible dream. I believe Wyclef can do that. 7. We must let our Western expectations relax a bit. Wyclef does not need to figure out how to turn the Haitian people into rocket scientists (at least not overnight). Haiti's needs, at this point, are massive but fairly basic. Food. Clothing. Shelter. Education. Jobs. Security. A major reconstruction project can put people back to work rebuilding their country and a major push for educational infrastructure will elevate the literacy and capacity levels of the people. Not that this is easy but he will have alot of support as President, including that of the U.S.
8. It will be interesting to see what it will be like if Wyclef is the President of Haiti while Barack Obama is the President of the United States. After all, the U.S. offered temporary status swiftly, and humanely, I might add, after the earthquake. These are new and trying times. They are also times for new possibilities. I have read criticism that Bill Clinton wants to turn Haiti into a new colony (as if, in its tremendous poverty and need, it isn't already), working in factories and engaging in tourism. Well, if I recall correctly, that's exactly what drew Americans (especially African Americans during the Great Migration) to the North. We came for new opportunities, to work in factories, to have jobs and to make new dreams. Let the Haitian people grow and if they want those jobs, let them take them. Generally speaking, there is nothing wrong with working in factories and it's 99% better than what they have now---which is next to nothing! As for the tourism, Royal Caribbean was still docking on Haitian water during the immediate post-earthquake period but how much of that revenue was shared and how much made it into Port-Au-Prince? We must stop fooling ourselves. There's nothing wrong with tourism, as long as we have more fairness and opportunity for the Haitian people. 9. I saw this article in 2000 when I was still a graduate student in American and Africana Studies. I have never forgotten how insulting it was to read the headline, "Ordinary Dutchman is African King" and I think it's important for us to remember how African people (which includes Haitians, by the way) are seen throughout the rest of the world---and why. So now, let an "Ordinary Haitian" be a Haitian President and let us re-imagine what the African can do and be in the world. Haiti is the size of the State of Maryland in the United States. Wyclef can do this. 10. And finally, my last reason is because it seems as though THE MASSES OF THE POOR PEOPLE OF HAITI want Wycelf to be their President and he is clearly inspiring a level of hope in a people so downtrodden and disgusted by their present leadership and longterm corruption (Duvalier, etc. ), that they will accept the leadership of a seventhsonofaseventhson to come and lead their country. Further, Wyclef's work in Haiti has been in the poorest, roughest "scariest" and apparently most violent and gang-ridden neighborhoods. If he can go in as peacemaker and provide aid to "the least of these", then he should be able to help everyone from the bottom up. I couldn't care less what the Haitian elites want, quite frankly. Over 50% of the Haitian population are YOUNG people who want something new. And they seem to want Wyclef. Who am I to argue with the people? All I can do is pray for the country, offer my support when I can and, for certain, encourage all of us to dream of a better world filled with great possibility and allow for the unexpected. Side Note: One never really needs a reason to watch If I Ruled The World by Nas featuring Lauryn Hill but I think it might be an appropriate soundtrack for this topic. (h/t Dr. Goddess).